Don’t Worry! Chocolate Lush Cake Won’t Get You Drunk…Well, Maybe On Sweetness! I am a fan of cold cakes. For one, cold cakes are easier to make than the usual sponge cakes. And two, cold cakes are needed to be served chilled because it’s made of the creamiest layers. I just really love the taste of cream in my mouth. 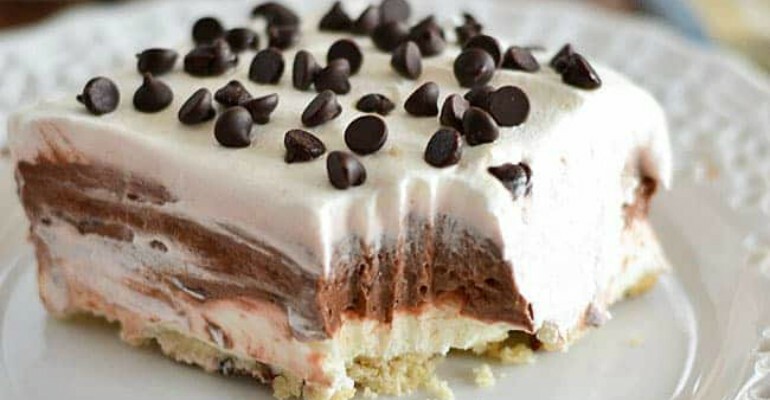 It’s like eating ice cream and cake at the same time, but without the feeling of being extra full. I’m the queen of impromptu get-togethers, and creating last-minute desserts is my usual problem that you just solved. This recipe is a winner dessert recipe! In a medium bowl, combine flour, brown sugar, salt, and pecans. Cut in butter with a rigid pastry cutter or a fork until crumbly. Press mixture evenly onto bottom of 9 x 13 inch pan. Bake for 18–20 minutes, or until crust is set and slightly browned. It should smell nice and toasty, buttery and nutty. Remove to wire rack to cool completely. With a blender, whip cream cheese and powdered sugar until completely smooth. With a rubber spatula, fold in 1-1/2 cups of Cool Whip from the 12-ounce container until combined. Spread mixture onto cooled crust. Refrigerate while preparing the next layer. In a medium bowl, whisk pudding with milk for 2 minutes. Pudding will become more and more thick as you whisk. Spread pudding evenly over cream cheese layer. Evenly spread remaining Cool Whip from the 12-ounce container over chocolate pudding layer. Sprinkle with shaved chocolate. (I use a vegetable peeler, running it down the sides of a chocolate bar.) Refrigerate for 4 to 6 hours or overnight before serving. Quick Tip: Always serve this dessert chilled. Thank you Kitchen Meets Girl for this wonderful photo. Sink Your Teeth Into Grandma’s White Chocolate Macadamia Nut Cookies! No-Bake Peanut Butter Pie Bars: They’re To Die For!